I would like to write some lines about this, as it took some time for me to realize how to do it correctly. Let me explain it with an example. 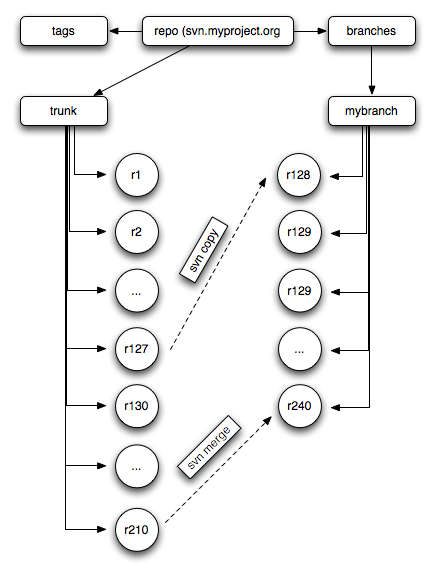 In this repo we have the usual trunk, branches and tags repo layout. Let's forget about tags, as we are not going to use it for the purpose of this post. We start to use the repo with the initial import (r1, aka revision 1) inside the trunk. Then we continue adding more changes to the code, up to revision 127 (r127), where we create a new branch (called mybranch) using the svn copy command (r128). At this point the development continue, but some developers work on the mybranch branch (doing commits up to r240) and some other developers work on the trunk code (doing commits up to r210). And now is when the problem happens. Imagine we need to unify the development process in only one branch of development. As our main development was inside the mybranch branch we try to get the changes made into trunk (since we created mybranch) back into mybranch itself. $ svn merge svn+ssh://svn.myproject.org/svn/trunk . The problem with that is that it doesn't work at all. It will do some strange merges (for example, it will try to merge back things from revisions like r29 which changes are already in mybranch). $ svn merge -r 127:240 svn+ssh://svn.myproject.org/svn/trunk . This will merge back the changes made in trunk into mybranch.